I'm new to generative design and more in general code art, so for now I'm just looking around trying to replicate artworks in order to get confidence and learn the program myself. While looking for tutorials on YT I stumbled upon this video (https://www.youtube.com/watch?v=O6vcyj12qcY) and I wanted to recreate something similar. Is there anybody who could help me or at least point me out the nodes I should be looking into? Welcome to NodeBox. 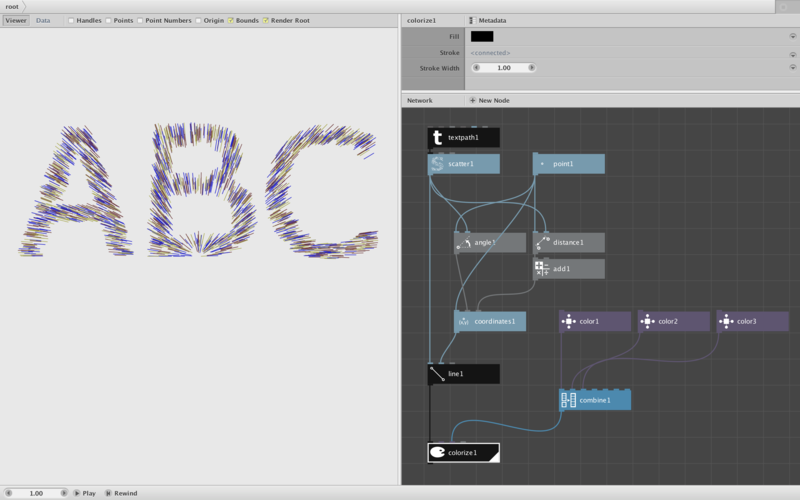 NodeBox is a great generative art tool well suited to make the kind of video you linked to. Recreating existing work is a great way to learn. The eight nodes in the attached screenshot would be a fine way to start. I am also attaching a NodeBox network that you can open and play with. Hit the play key in the lower left corner of the NodeBox window to see the animation. You can save it as an MP4 if you want. grid - creates a list of X,Y positions, one for each blocky "pixel"
By hooking the frame node to the shift node, you shift the list of random colors one unit for each frame of the movie. The colors wrap around the positions in the grid. That should be enough to get you started. Try rendering (double-clicking) each node in turn to see what it does and change the parameters to see what happens. Please scroll through the Show Your Work section of the forum to see other examples to learn from. And please don't hesitate to ask for help if you get stuck. Hey John thanks for replying! I've been messing around on it, even though I didn't manage to achieve an effect that's similar to the video above. This to me looks more like a tv glitch. Could I please also ask what's the compare node for? I didn't understand it. Thanks a lot again it is so nice from you. Compare often functions like an if statement in other computer languages. You can hook two different numbers to that node and do one thing or another depending on the outcome. I used Compare in a tricky way here. Although the output of compare is either "true" or false, if you hook that output to a node with a numeric input, it will interpret true as 1 and false as 0. In this case I fed it into the gray port of a gray_color node. Normally this is a way of producing a gray value between 0 (black) and 255 (white). But I set the range of that node to 1 instead of 255 so that the node can produce only two colors: 0 (black) and 1 (white). When I feed random numbers between 0 and 1.999 into those two nodes, they produce a random sequence of black and white colors which I then use to create that "TV glitch". Sorry - that was a bit tricky; probably shouldn't have done that in a beginner demo. You say you played around with my quick little demo but were unable to replicate the pattern in that YouTube video. I am not surprised. My demo was only intended to get your feet wet. 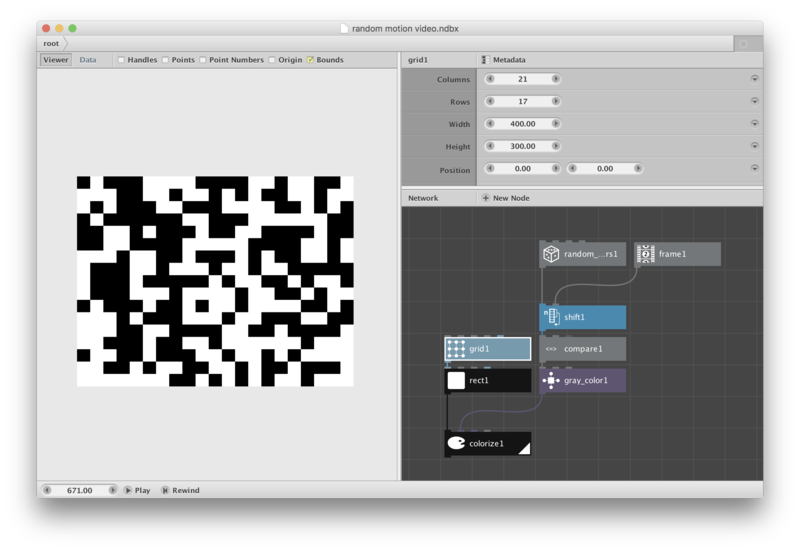 I wanted you to see how to generate random blocks of black and white and how to animate them using the frame node. For this I used the simplest method of animation I could think of: the shift node. At high speed this does indeed produce a kind of TV static effect. The pattern in your YouTube video is much more complex. I'm frankly not sure exactly what it is doing. There are ripples which sometimes look like expanding circles, differences between the middle and the ends, effects which speed up and slow down. Once you figure out exactly how the pattern is changing, replicating in NodeBox should be *fairly* simple (or not depending on just how sophisticated the pattern generator is). The hard part if actually figuring out how the pattern is changing. You might want to start with a simpler animation to start out. I thought that forums and good manners were dead on 2018's internet. Thankfully I was wrong. Thank you so much again. I've been checking some of your work too ("Fracture" is hella simple but still so appealing!) trying to figure out what each node does and why some are connected one another. If any questions come up my mind I'll post them here. I've had to stop for a bit but now I'm back and I've been following some more tutorials here. On the Nodebox 3 tutorial, precisely "Using angle and distance. "(https://www.nodebox.net/node/documentation/using/math.html) I noticed that it doesn't go on and tell how to color lines. I tried to figure it out by my own by creating a colorize node and sending the line node to it but it didn't work out, neither by sending both to a combine node. Yes, the screenshot in that tutorial shows colored lines in the output pane but the doesn't show any nodes below the line node and makes no mention of colorizing in the text. I guess whoever wrote the tutorial only wanted to show you how to create the basic "hair" effect. Frustrating. Your original instinct of connecting the line node to a colorize node was correct. What I suspect happened, though, is that you set the FILL color instead of the STROKE color and perhaps did not set the stoke width to a value greater than zero. Lines, unlike shapes, do not have anything to "fill". To color lines you have to use the stroke color and set the stroke width to something greater than zero. The bigger the stroke width, the thicker the hair. If you want to recreate the colors in the tutorial screenshot you will need to define several colors using color nodes, combine them using a combine node, and then feed that combine node into the STROKE (COLOR) port of the colorize node. The colors will cycle though the individual hairs. Let me know if that helped and if you have any other questions. I am glad to see that you are still fighting your way through the tutorials. Thanks a lot John. It was actually pretty stupid from me, I've done everything right except giving the stroke a width. Now it works.